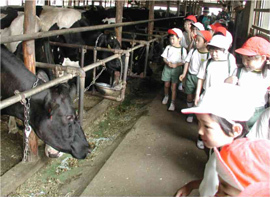 Elementary school kids visit a farm during their school excursion. During the school year, all of the students in a particular grade usually take a field trip to a local place of interest. The field trip may be designed to teach students about something they have learned about in school. So they may take a trip to the mountains to learn about the environment, to a factory to learn about how companies work, or to a farm to learn about crops or animals. Field trips provide students with a chance to interact more informally with other students and teachers than they usually do. Students are usually permitted to bring snacks on field trips; ordinarily they are not allowed to bring snacks to school. Field trips usually last for one day. Junior and senior high school students, either at the end of their second year or the beginning of their third year, take a long trip to another part of the country. These trips may last as long as week. Students usually travel to famous historical spots. Kyoto, the former imperial capital, is a popular destination. In some schools, students even take trips overseas. When students return to school, they are expected to write a short report about what they learned while they were away.